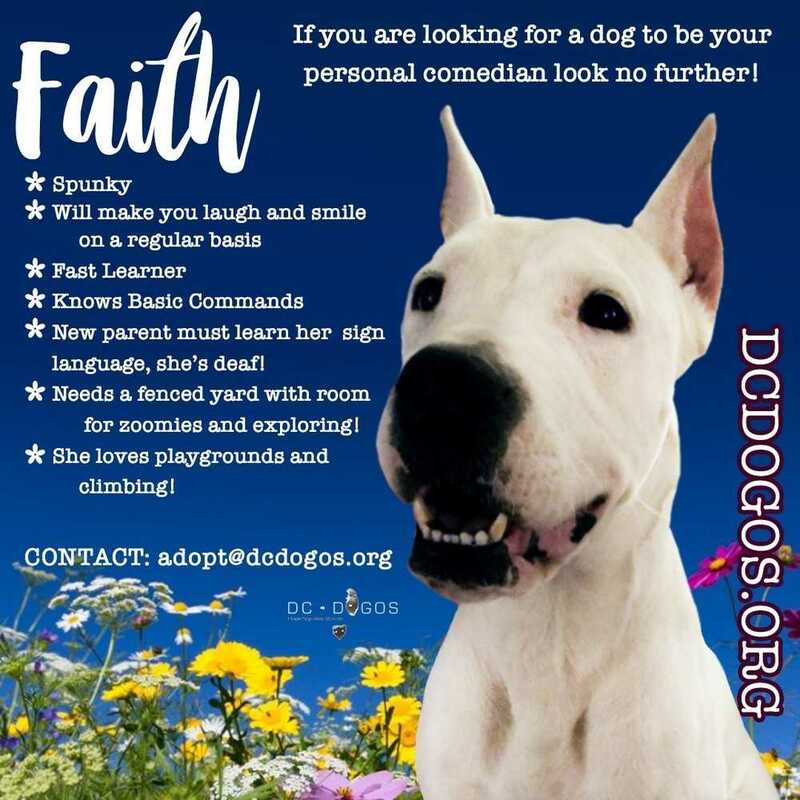 Faith is a sweet female dogo argentino with a loving soul and heart of gold! Her will to survive is beyond impressive and she will surely be a gift to her next family. Faith is deaf but that doesn't stop her from being 100% awesome! She is a brilliant girl that wants to learn and loves being rewarded with treats and kisses. She doesn't have all her manners yet but is learning every day how to behave like a lady! Her favorite past time is counter surfing but we are working towards a different interest to better suit the home life! One new improvement with Faith is that she is now learning how to play with other dogs!! We would still recommend an owner that understands the breed and how to properly socialize dogs as this still needs work. If you are looking for a dog to be your personal comedian look no further, Faith is that dog!! She is spunky and she will make you smile and laugh on a regular basis! The perfect human is someone with patience to learn her language, which is sign! She is a fast learner and knows the basic commands. This human also needs a safe fenced in yard with room for her to explore! Major plus for her is if you have a playground, she loves to climb things!!! Faith says that she wants anyone interested to please do their research on deaf dogs before applying! She says that dogs like her make great pets once their humans work on their own sign language commands. Faith also says it's true that deaf dogs are more "clingy" that other dogs because they want to be by their human's side as much as possible because they depend on their human so much! One last thing, Faith did say she loves wide open spaces to run but has been advised that deaf dogs really need a yard with a high (6ft+) fence. Apparently this helps humans from losing their deaf dogs that can't seem to hear them when they call them to come back! Thank you for your interest in adopting. You can learn more about her rescue that loves her to pieces at www.dcdogos.org.